Day 45 (14th March) brought some more surprises, which warrant another blog post. 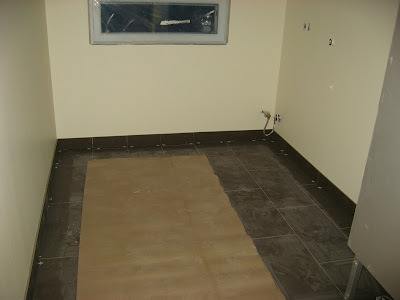 The tiled floors have now received their grouting. When we had to decide which tiles, kitchen doors, etc., we wanted, we were totally puzzled when they gave us the choice of various grouting colours. Who would've thought of that? Anyway, we thought it looks most natural if we use the good old plain grey concrete colour, which nicely sets the large floor tiles apart while still being subtle. 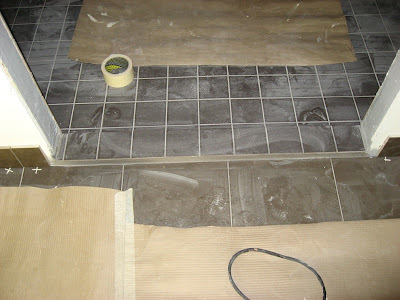 The only thing missing is the final attachment of the tiles replacing skirting boards, which have not received their grouting yet. Here's a view at the doorstep between utility and shower room. The shower room has smaller tiles, and an elevated door step has been made of these tiles in order to prevent water from flowing out of the shower room. 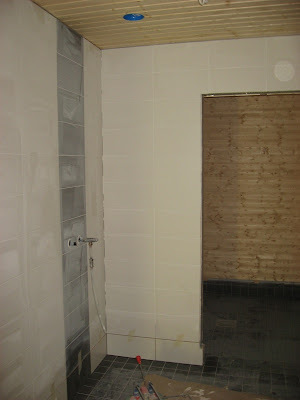 Another view of the shower shows that the wall tiles also have their grouting now. Here we chose white grouting, which disappears everywhere except around the brown tiles behind the shower. 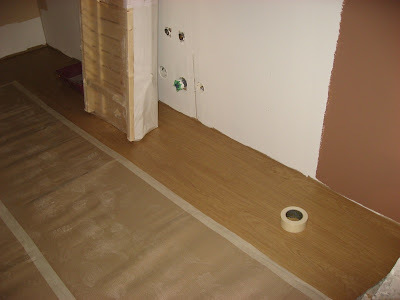 Also the laminate in the living room has appeared now, in anticipation of a possible early delivery of the kitchen on Monday. Currently the laminate is in the kitchen only. Unfortunately it's completely covered up by corrugated cardboard for protection, so one can only see a small area where the kitchen furniture will be located. By the way, the upright package contains the sauna benches!